Women of UGA’s mission is to foster a lifelong commitment to the University of Georgia by creating opportunities for personal and professional development, instilling a spirt of giving, and investing in the future of the university, its students and alumnae. 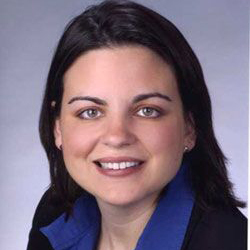 We recently got the chance to interview Kelly Kautz (AB’ 99, JD’02), in order to learn more about her experience at UGA and what drives her to stay involved with her alma mater. Here’s what she had to say! What year did you graduate from UGA? What was your major? I was a double dawg. I graduated in 1999 as a political science/criminal justice major, then I graduated from the School of Law in 2002. Why did you choose to attend UGA? I knew I wanted to go into law and possibly politics. If you look at the leaders of our state in that time, everyone was a University of Georgia graduate. If you looked at the governor, justice on the supreme court, secretary of state or speaker of the house, all of them were UGA graduates. It was the most influential university in our state, so I chose to come to UGA. What path led you to establishing your own law firm/practice? At the time, I wanted to run for elected office. I opened up my own practice so I could have the time and flexibility to do that. How did you get involved with the Women of UGA Leadership Council? I’m passionate about the University of Georgia. I’m a huge fan of not just sports, but the university itself. I wanted to give back to the university in ways that would continue to touch peoples’ lives, even after they have left school. When I heard that Women of UGA was being formed, I thought it would be a great opportunity to do what I wanted to do. What are you enjoying most about serving on the Women of UGA Leadership Council? I think there is a great group of women on the council. Everyone is equally passionate about our school. I’m chair of the events committee, so I work on planning and events, such as our Cookies and Cocoa, event we having coming up. Just being able to have outreach with not only women on the council, but other alumni coming back is really exciting. What is the most valuable piece of career advice someone gave to you? In the 8th-grade I had an attorney say, “If you take away one person’s rights, what’s to stop you from having the domino effect on others?” Another time, someone told me, “you can’t say anything about things unless you’re willing to make a difference.” That’s when I decided to go into criminal law and politics. What advice would you give to graduating seniors or recent college graduates? I would tell them that it’s difficult out there. It’s a different place and especially finding a job can be difficult sometimes. However, you all (students) have a great network of alumni, and you can’t be afraid to reach out and ask for help. You can’t give up. You have to keep trying. What’s your favorite thing to do when you visit Athens? As funny as it sounds, I really love coming back to Athens to eat. There are so many great restaurants in Athens. I love going back to the different restaurants. I really love to come back and have Cecilia’s Cakes. I think they sell them in a couple of restaurants, but they have a location on Milledge Avenue that I love to visit when I come back to Athens. I have a little 3-year-old who just got to ring the Chapel bell last time we visited Athens, so I can’t wait to start making these same memories with him. How has being part of the Women of UGA Leadership Council benefitted you? It has helped me reform a connection and attachment with the university. I feel like a lot of times when we leave the university, we lose that connection we had with the university. I have loved coming back to where I belong and feeling that attachment with the university. What is your favorite UGA memory? I spent eight years in Athens, and I don’t have any bad memories. I met my husband in Athens. I made lifelong friendships there. They’re all great memories. I used to be in charge of parade for homecoming in Athens. Working with the older cheerleaders that come back for the games, parade and pep rallies was such a blast and always a great time. Sharing that enthusiasm was them is one of my fondest memories. Women of UGA’s mission is to foster a lifelong commitment to the University of Georgia by creating opportunities for personal and professional development, instilling a spirt of giving, and investing in the future of the university, its students and alumnae. We recently got the chance to interview Terri Polk (BBA’86) in order to learn more about her experience at UGA and what drives her to stay involved with her alma mater. Here’s what she had to say! In what year did you graduate from UGA and what was your major? I graduated in 1986, and my major was finance. As the director of brand development at The Coca-Cola Co., I help to drive brand awareness of our tea and coffee portfolio brands across the U.S. The tea and coffee brands include Gold Peak Tea, FUZE Tea, Honest Tea and Peace Tea. What is the most important thing that you learned in college? I ran track at Georgia, so I would say the most important thing I learned was time management. Time management in terms of being able to accomplish my academic and athletic goals, manage friendships, have time to be student (as in being crazy), have fun and be a kid. So, the greatest thing I learned was how to manage my time to accomplish the things I wanted to accomplish. I was also able to add on additional skills in being persistent, relentless and hyper-focused. Those traits help me now. You know, it’s so random how things happen. I wasn’t engaged with UGA for a number of years. 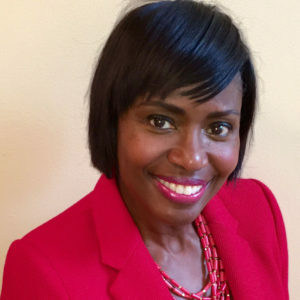 About five years ago, I ran into Yvette Daniels, the current secretary UGA Alumni Association (AB ’86, JD ’89) and she asked if I was ready to get engaged with Georgia. I asked to think on it a little bit. I thought on it for about a year, and I called her back about it about four years ago. I started just attending events that were sponsored in Atlanta and seeing exactly was the university was up to from an academic perspective. Then, I became involved a little later. Why is the Women of UGA Leadership Council important to you? You get to a point in your life when you want to start giving back for what you have received. That point has come for me in terms of being able to serve the university in a way that’s helpful for future students. Doing work to support the scholarship that Women of UGA has endowed is one way to do that for me. Being able to help students with an academic need was really intriguing for me. One of my professors gave me absolute support and was actually interested in my success. He would even come to track meets! It meant the world to me to see a professor at our track meets. That was phenomenal and a good memory for me. Another good memory for me was going to all of the sorority and fraternity parties in Memorial Hall back in the day. It was really hot, but fun. It was the only thing going on so if you weren’t at the party in Memorial, what were you doing? What about the Women of UGA Leadership Council excites you the most? The fact that the council includes women with diverse backgrounds and interesting things that they do. From their experiences at Georgia to what they do professionally now, that is quite motivating. From a separate perspective, being able to look around the room and see the success that these women bring to the table. Overall, it’s the ability and excitement to create programs that bring alumni together and bring opportunities to raise funds for the Women of UGA Scholarship Fund. That really excites me. What’s the biggest change you’ve seen at UGA since you were in school? The way the campus has expanded, the majors being offered and the competitiveness of getting into the school. I also like the emphasis on global education and experiences. Seeing the opportunities to study abroad makes me happy. When I was going to school, the thought of going abroad was out of reach to even think about. Now to see it as generally part of the curriculum to go out of the country and get a global perspective is awesome and one of the best changes I’ve seen. Where was your favorite place to eat when you were a UGA student? I was a poor student, so my favorite place to eat was O-House. I lived at O-House. I ate at O-House. I studied at O-House. I swam at O-House. I walked out the door and went to Sunday brunch at O-House. My food was already paid for, so I went to O-House. The food was really good! Women of UGA’s mission is to foster a lifelong commitment to the University of Georgia by creating opportunities for personal and professional development, instilling a spirt of giving, and investing in the future of the university, its students and alumnae. 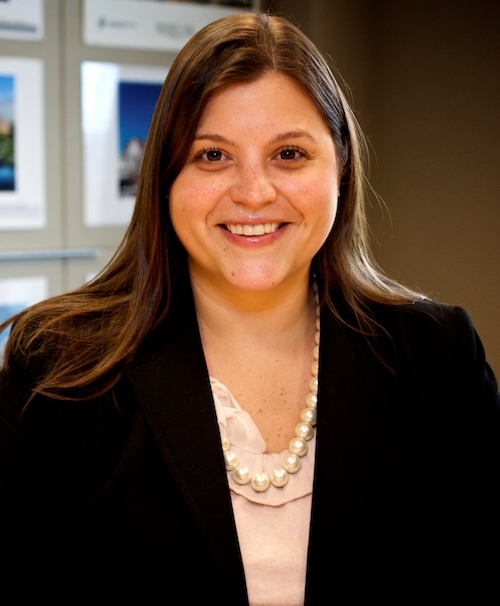 We recently got the chance to interview Alissa Vickery (BBA ’01, MACC ‘01), fundraising chair for the Women of UGA Leadership Council in order to learn more about her experience at UGA and what drives her to stay involved with her alma mater. Here’s what she had to say! What kind of advice would you give to a current UGA student? Work hard and appreciate the fact that, whether you’re paying for it or your parents are paying for it or you have scholarship money, that what you’re doing day-to-day matters, embrace what you’re doing, the classes you’re taking and what they’re trying to teach you because the more immersed in the content you can become the more relatable it will be. Your grades matter! The other thing I would say is to figure out something other than school to become a part of because when you come out of school, you don’t want all you have on your resume to be your GPA. People are looking for someone well-rounded, especially with the current job market. If you want to set yourself apart, figure out how to make sure you’re a well-rounded individual. What’s the most important thing you learned while at UGA? I was that kid in high school who never had to study that hard so I think I came to Georgia not really knowing how to study as a result, and I got slapped in the face pretty hard my freshman year first quarter. I failed my first test. It was a calculus test and I thought “I had this class before. It’s fine.” It wasn’t fine because I just didn’t know how to be a student, but I turned it around pretty quick. I figured out how to study, and I did come out of that class with an A even though I failed that first exam. So I learned how important hard work and perseverance are, whether you get the A or the B. How did you get involved with Women of UGA? A women I had met through work had mentioned that the Alumni Association was looking to create a new women’s affiliation group similar to young alumni and black alumni, specifically geared towards women, and she thought that I would be great so I applied. For me, UGA continues to be a part of who I am and what we do in our free time. We come up for football game, come up for gymnastic meets occasionally. We love the town and try to come back every chance we get, and this was just sort of one more way to still be engaged with the university and at the same time giving back my time and trying to make a little bit of a difference. What about the Women of UGA Council excites you the most? For me, it’s all about outreach to the alumni community. It’s a lot of networking and getting to know new people but through that our end goal is that we want to raise money for scholarships for students in need. We want to close the gap for students who need a scholarship to be able to attend UGA. You can really make a difference in someone’s life that way. We want alumni to feel engaged and impacted enough that they’ll want to give back. So what’s your favorite memory from UGA? My freshmen year we played Auburn at Auburn, and it was a really cool game. It was the first time any game had gone to four overtimes with the new rules. It was at Auburn and some of my friends from high school went to Auburn and obviously, I had friends at Georgia too. We were all together and sitting in the second row, in front of the band with the students. It was the game that Uga actually leapt up at the Auburn player and tried to bite him because the Auburn player was taunting him. I’m actually in that picture that you see everywhere of Uga jumping up at the guy! We also won that game so Georgia fans rushed the field afterwards. It was one of those things that looking back at is such a cool experience! Go Dawgs! Every year, the UGA Alumni Association recognizes top businesses owned by UGA graduates through the Bulldog 100 program. These outstanding businesses range from financial firms to barbecue restaurants and even interior design companies. 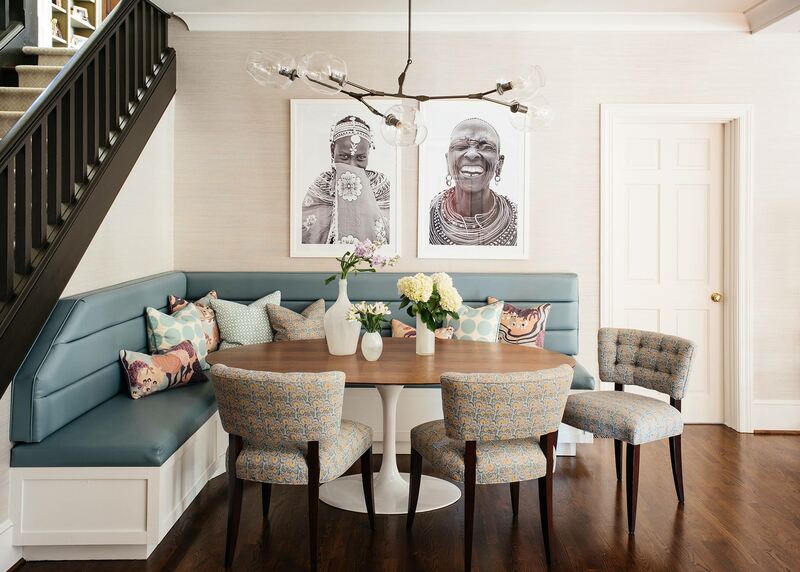 This year, Women of UGA Council Member Amber Gizzi (BSFCS ’14) from Pineapple House Interiors in Atlanta and Charlotte Lucas (BSFCS ’05), owner of Charlotte Lucas Interior Design in Charlotte, NC made the list. We had the opportunity to talk with Charlotte and Amber about their time at UGA and their experiences with Bulldog 100. Charlotte and Amber both graduated from the furnishings and interiors program in the College of Family and Consumer Sciences (FACS). They described the program as influential to their development as interior designers and as business owners. 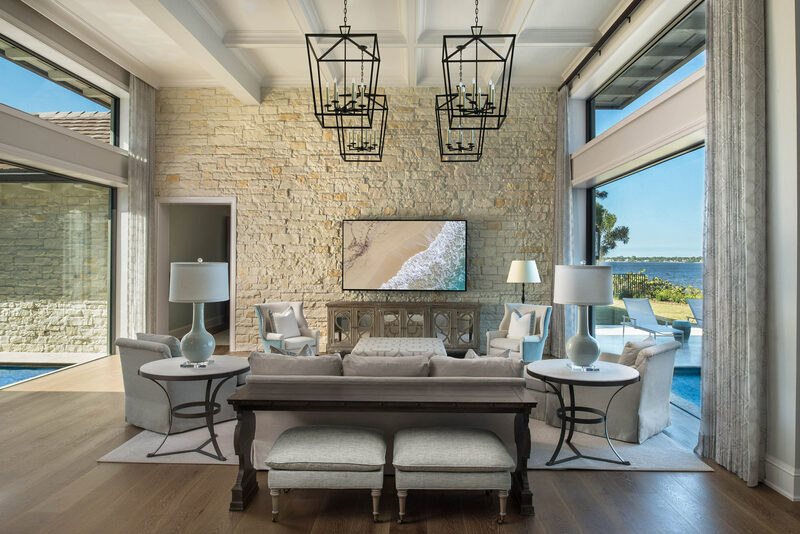 Charlotte’s company, which specializes in “providing perfectly proportioned rooms and one-of-a-kind, customized designs,” made the Bulldog 100 list for the second time this year, coming in at spot number 15. Her company placed fourth on the list last year and was the first time a graduate from Family and Consumer Science made it in the top 10. Amber, whose business Pineapple House Interiors made the 2018 list at number 56, shares that sentiment. Pineapple House Interiors works globally on projects ranging from decorating, to renovations, to new construction. Amber credits her UGA education with preparing her to take on a partner role at such a young age. Still, she says nothing beats real world experience. Nominations for the 2019 Bulldog 100 are open through May 31, 2018. Women of UGA’s mission is to foster a lifelong commitment to the University of Georgia by creating opportunities for personal and professional development, instilling a spirt of giving, and investing in the future of the university, its students and alumnae. 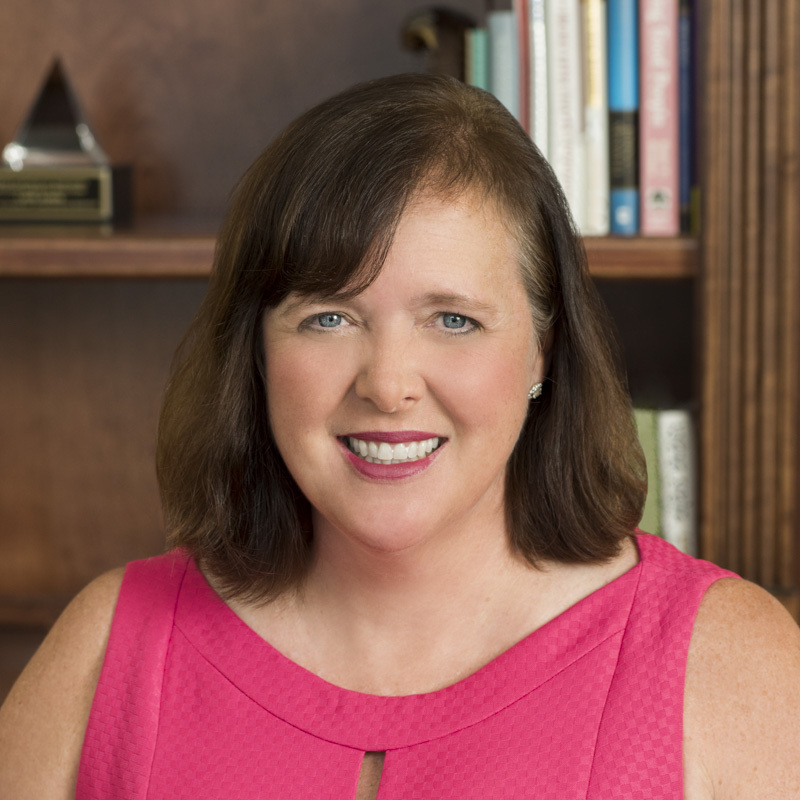 We recently got the chance to interview Anne Beckwith (BBA ’90), secretary for the Women of UGA Leadership Council in order to learn more about her experience at UGA and what drives her to stay involved with her alma mater. Here’s what she had to say! Tell me about your time as a student here at the University of Georgia and what role the university played in preparing you for your future. The University played such a large role in my life; it’s hard to narrow it down. It’s fall football Saturdays since I was 10, it’s my friends, it’s my husband, it kicked off my career, it gave me opportunities to reach beyond the skills I learned at home. Some of it is little things, like attending a large reception at the President’s home, so that the next time I was at a large gathering where I only know a limited amount of people, I was better prepared. Some of it was larger things, like finding out what I was good at–I ultimately enjoyed a major that was not on my radar as a freshman. Do you have a cause that you are passionate about? If so, how do you pursue this in your personal and professional life? After my family and my dogs, UGA is actually one of my passions! I think it is an incredible resource for the State of Georgia and helps and binds people throughout the entire state. Personally, I want to help UGA students to experience the entirety of college – attending a university is more than just going to class, which you should go to class!! It’s socializing with your peers but also with adults. It’s making good friends. It’s learning to give a hand to those who need it. I personally feel strongly that as a successful UGA graduate, I should try to help others to have the space in their college lives to do those outside things, which I can do by increasing UGA’s ability to address financial need. It’s hard to do more than go to class when you are worried about your next meal or where you will sleep next week. Women of UGA has been personally enriching because I can see how we have raised money for an endowed need based scholarship and how we are creating events that keep women alumni in touch with their university. I think the new Cookies & Cocoa with Hairy Dawg was an amazing event that I can see being a family staple for decades. Meanwhile, our new Mentorship Monday series is personally and professionally enriching our more recent graduates. What parting advice do you have for students who are trying to determine the best career path for them while at UGA? Be open minded and don’t be afraid to be bad at things the first, the second or the umpteenth time you try something. Go to events, even if you don’t know any or many people there; you already know everyone in your dorm room or apartment. Talk to people and ask questions; this can be professors, the Career Development Center, people you meet at the events, etc. To learn more about Women of UGA, visit alumni.uga.edu/womenofuga and connect with the council on Instagram. 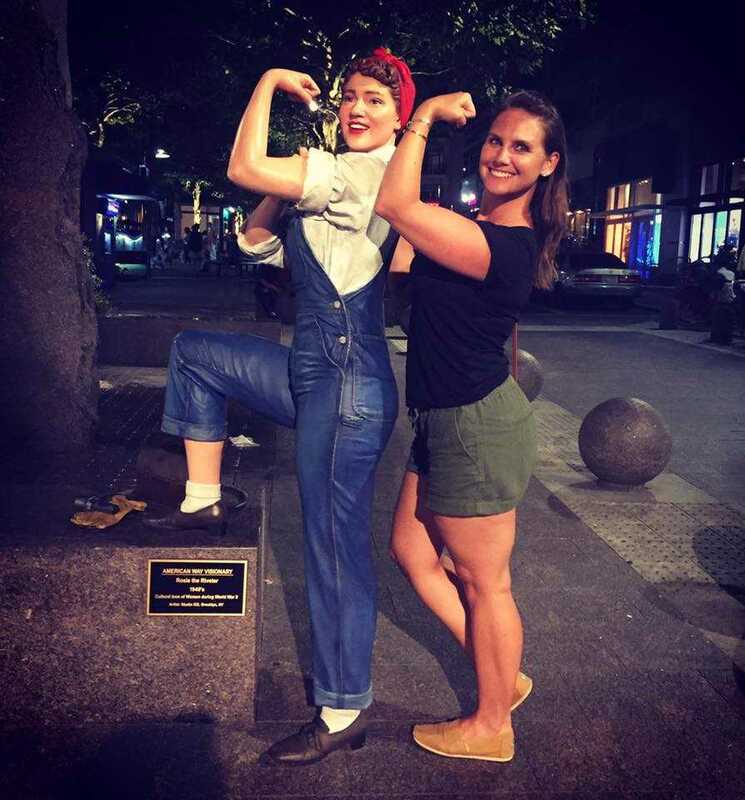 This post was written by Rachel Webster (ABJ ’08), a member of the Women of UGA Leadership Council. On a cold December evening, there is nothing better than getting out of Atlanta traffic and walking into a warm, fragrant pie shop. That is, there is nothing better unless you are also greeted by the Women of UGA Leadership Council and plenty of other alumnae when you get there. 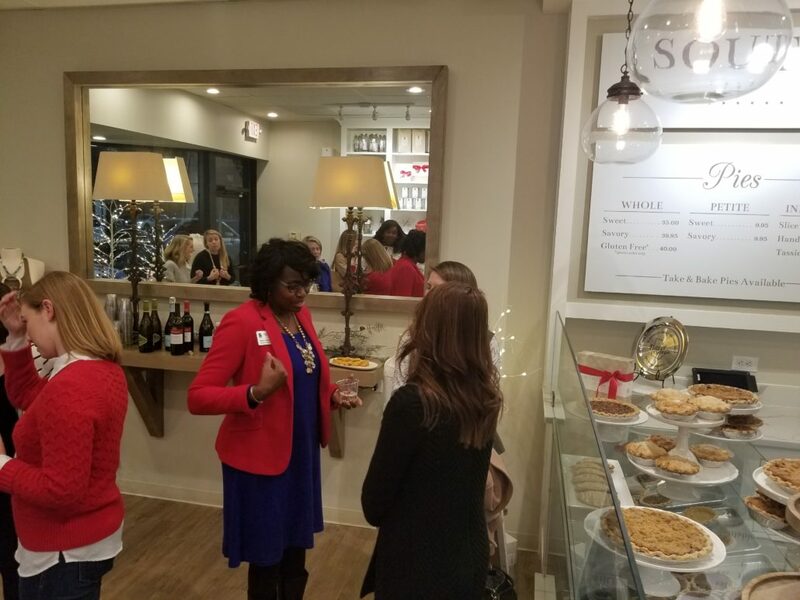 This was the scene in two locations of Southern Baked Pie Company on December 14 as they hosted the Women of UGA groups for a percentage night to support the Women of UGA Scholarship Fund, along with networking and sweet treats. 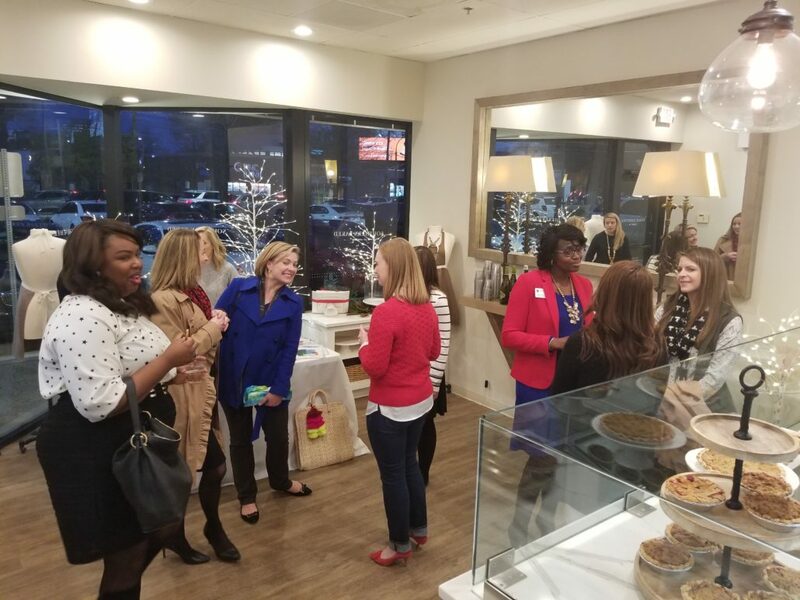 Locations in Alpharetta and Buckhead offered pie samples, like the delicious streusel-topped apple cranberry pie, and complementary beverages as alumnae mingled in the cozy shop atmosphere. In Alpharetta, alumnae browsed offerings from vendors Jaco Jewelry and Hands of Life Massage Therapy. In Buckhead, Establishment Home and Custom Bling by Charlotte joined the networkers with tables full of beautiful gift ideas. 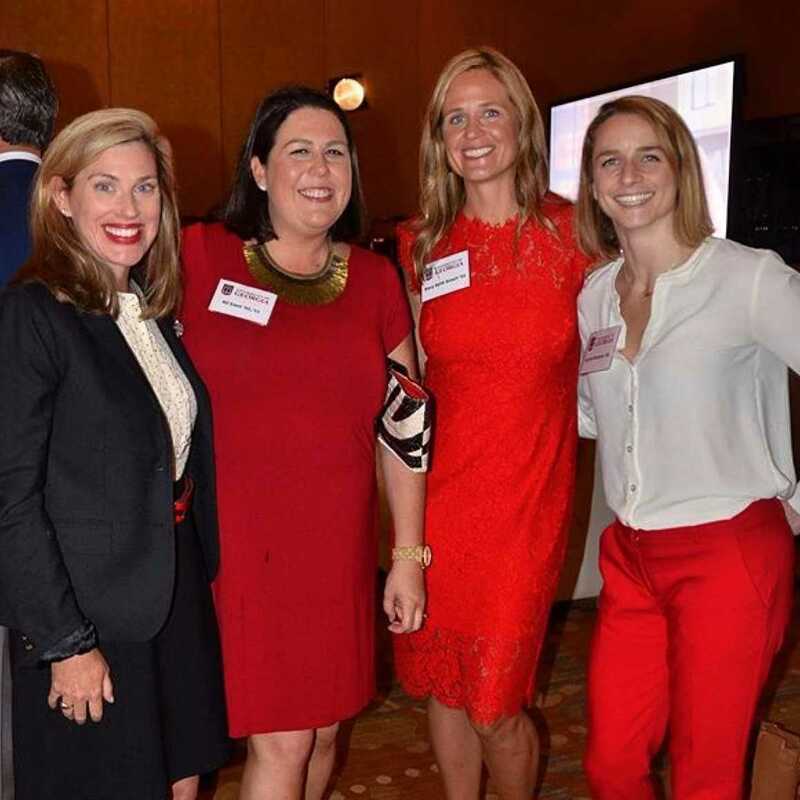 The event embodied the two main tenets of the Women of UGA affinity group – giving alumni opportunities to create relationships within the University of Georgia network, and raising money to support education initiatives. In this case, 20 percent of Southern Baked Pie Company’s sales of their signature savory and sweet baked goods will support the Women of UGA Scholarship Fund. Thank you to all of our event partners and attendees! With you, giving back is sweet. Join Women of UGA for Mentorship Mondays, a professional development initiative featuring notable graduates. In this intimate breakfast series, participants will have the opportunity to hear from alumnae at the top of their fields, connect with fellow graduates, and gather tips to take their careers to the next level. Get ready to be inspired and build a network that will offer new perspectives and share things they’ve learned along the way. Speakers and panelists include Kim Bearden (BSED ’87), co-founder of The Ron Clark Academy, Kappy deButts (BBA ’97), executive director of The Zeist Foundation, Inc. and Maritza McClendon (AB ’05), Olympic medalist and senior brand marketing manager at Carter’s and OshKosh B’gosh. There are only 50 slots available, so be sure to register today! The complete series of events costs $125 per person. Breakfast is included in all sessions and $35 of each registration supports the Women of UGA Georgia Commitment Scholarship. Events will be held at Carr, Riggs & Ingram in Atlanta, Georgia. More speakers will be announced soon. There are only 50 slots available, so be sure to register today! Questions about Mentorship Mondays or the Women of UGA affinity group? Email Luke Massee! 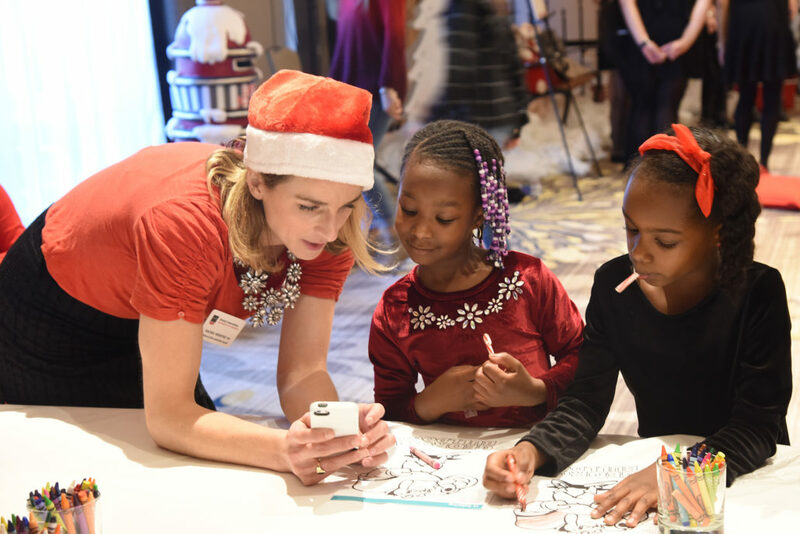 In early November, Women of UGA kicked off the holiday season with Cookies and Cocoa with Hairy Dawg. The following recap was written by Rachel Webster (ABJ ’08), a member of the Women of UGA Leadership Council. Here’s a recipe that’s sure to get any Dawg fan in the holiday spirit: start with hundreds of freshly-baked sugar cookies, and don’t forget red and black sprinkles for decorating. Add some hot cocoa, with whipped cream and plenty of fixings. Top it off with Hairy Dawg, dressed in his holiday best and ready for family photos. 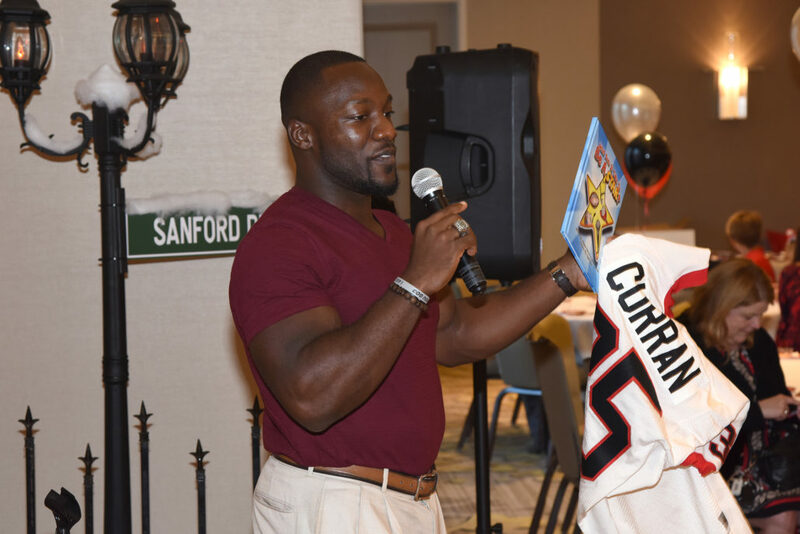 This is the guide to the first annual Cookies and Cocoa with Hairy Dawg event, hosted by the Women of UGA alumni affinity group on November 5 at the Hyatt Atlanta Perimeter at Villa Christina. There were a few surprises as well! Guest readers David Greene (BBA ’04), Rennie Curran (BBA ’17), and Bonney Shuman (BBA ’80), president of the UGA Alumni Association Board of Directors, stopped by to read stories to the children. There was even a holiday market with products for sale from UGA alumni and supporters, such as Jittery Joe’s and Lily Wrap. 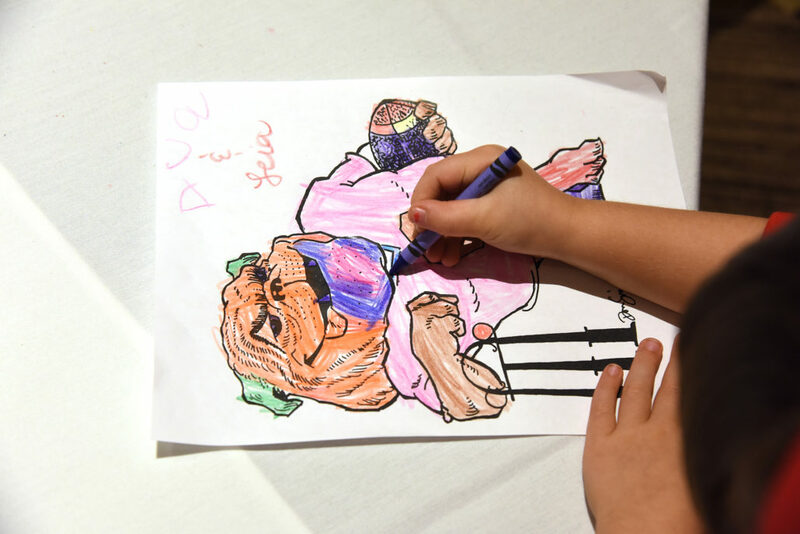 Although Uga X was not in attendance, he felt the love from all the fan mail little fans created to send to him in Savannah. A portion of the money raised from this sold-out event went to the Women of UGA Scholarship Fund, which was endowed this year through the fundraising efforts of the Women of UGA Leadership Council. Thank you to all the attendees, sponsors and partners who helped with this year’s Cookies and Cocoa with Hairy Dawg event. For more information or to donate to the Women of UGA Scholarship Fund, click here. To see photos from Cookies and Cocoa, click here. Women of UGA’s mission is to foster a lifelong commitment to the University of Georgia by creating opportunities for personal and professional development, instilling a spirt of giving, and investing in the future of the university, its students and alumnae. 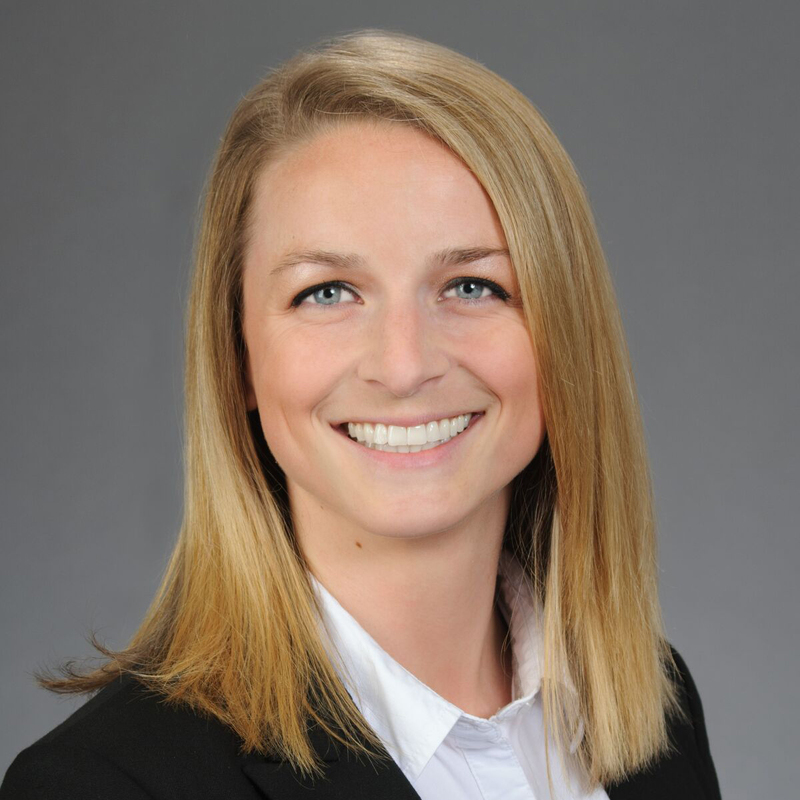 We recently got the chance to interview Bailey Maxwell (ABJ ’09), member of the Women of UGA Leadership Council in order to learn more about her experience at UGA and what drives her to stay involved with her alma mater. Here’s what she had to say! My 4 (and an extra football season) years at UGA are some of my fondest memories. The university did a great job of encouraging students to connect not only with peers but with faculty and staff. It was these relationships that I feel had a true impact on helping me realize my true self and what I wanted out of not only my time in college but life in general. I was pushed out of my comfort zone and challenged like never before which I feel opened my mind and heart and has everything to do with who I am today. I am extremely passionate about giving back to my community and I try not take anything I have for granted. I volunteer with numerous organizations in the Atlanta area and take every chance I get to give back to a community that I feel gives me so much. I am extremely lucky in that I was chosen to serve as president of the Bennett Thrasher Foundation, a not-for-profit that is funded by the company I work for. We devote our time and resources to making the greater Atlanta community a better place. The Women of UGA Leadership Council is important to me for a number of reasons. First and foremost, it is an opportunity to put my skill set to use for the greater good of the university and my fellow alumnae. I think it is important for us to foster relationships and encourage continued connection beyond the day we walk under the Arch for the first time. Secondly, I love seeing women empower each other and encourage each other to reach our full potential. How do you hope to make an impact with Women of UGA, and what excites you most about your future with the council? It is really exciting for me to connect with fellow alumnae that I didn’t have the opportunity to meet during my time at UGA. They came before me, after me and are a diverse representation of all areas of campus. I think we all have a lot to offer each other as well as the council and UGA alumni group as a whole. The biggest impact I think we will make as a council is continued awareness and funding of the Women of UGA Scholarship. The academic rigor of attending the University of Georgia is hard enough without wondering if you will be able to afford attending semester to semester. If we are able to lighten that burden for even one student, I feel like our time and talent will have been well spent. The best advice I can give students is to attend career fairs and networking opportunities, ask questions of people you know in professions you have an interest in and keep an open mind. Women of UGA’s mission is to foster a lifelong commitment to the University of Georgia by creating opportunities for personal and professional development, instilling a spirt of giving, and investing in the future of the university, its students and alumnae. 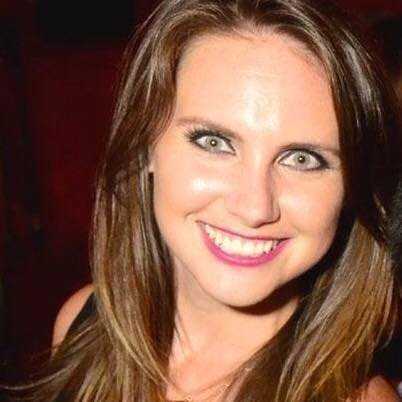 We recently got the chance to interview Rachel Webster (ABJ ’08), member of the Women of UGA Leadership Council in order to learn more about her experience at UGA and what drives her to stay involved with her alma mater. Here’s what she had to say! UGA prepared me in so many ways for life after graduation, not the least of which was the community that the university fosters. I graduated from the Grady College of Journalism and Mass Communication, and I was very fortunate to be in the Honors program and a member of the Red & Black newspaper staff. Grady College taught me the habits of being a professional person, the Red & Black helped me practice those habits and the Honors program helped me form relationships with a diverse group of people. The ability to communicate will always be helpful in any professional setting, and many of the people I met at UGA are my best friends today. Do you have a cause that you are passionate about? If so, how do you pursue that in your personal and professional life? I am passionate about girls and women having equal educational, professional and vocational opportunities. Besides the Women of UGA Leadership Council, I’m also a member of a young women’s professional leadership group, and I’m a mentor to a current college student. I had many opportunities presented to me when I was younger, and I hope to help other women find opportunities that suit them as well. First of all, I would say that finding a group of dedicated alumnae like the council is just so rare. These women are so inspiring and hard-working, and I mentioned before how much I value community and relationships. I always enjoy being involved at the university, and through the council, I am able to have a larger impact via the Women of UGA scholarship fund. I am most excited about the Women of UGA scholarship fund, which is endowed as of this year. The endowment means that the scholarship will continue to help deserving students with their educational costs in perpetuity, which seems like a pretty fantastic legacy for any group of alumni to leave. I am excited by the prospect of spending time with students who receive the scholarship and seeing the difference it makes in their lives to be at the University of Georgia. This is the best career advice I got, and I got it from my hairdresser. He is a very smart man, and I was struggling in a career that I did not really enjoy. He told me to think about the actual activities that I want to do all day, and then work backwards into finding a job that allows me to do those activities. I literally thought about what I’m good at, and what I think would be valuable to others, and started networking through my communities to find opportunities. I have been in my new career as a public relations professional for about five months now, and it was such a good move for me professionally.